Can you believe we're already into February?! It seems like Christmas was just "yesterday!" 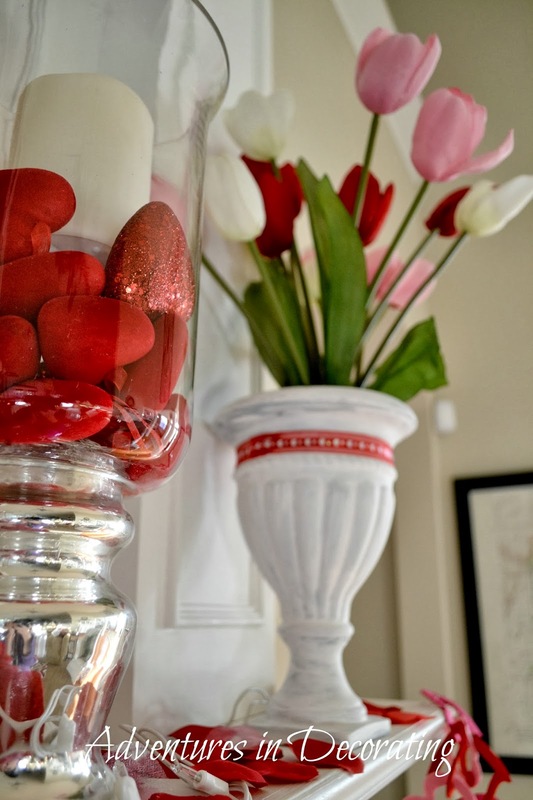 As soon as our Christmas decorations came down, our Valentine decor went up ... it's fun being able to continue the splashes of red to celebrate the month of "love!" 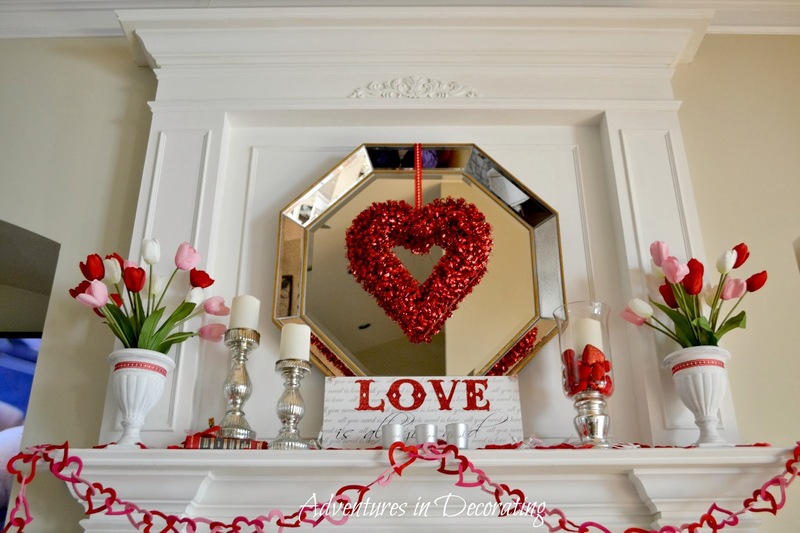 I wanted to share our Valentine mantel before it's time to transition to an Easter/Spring one. 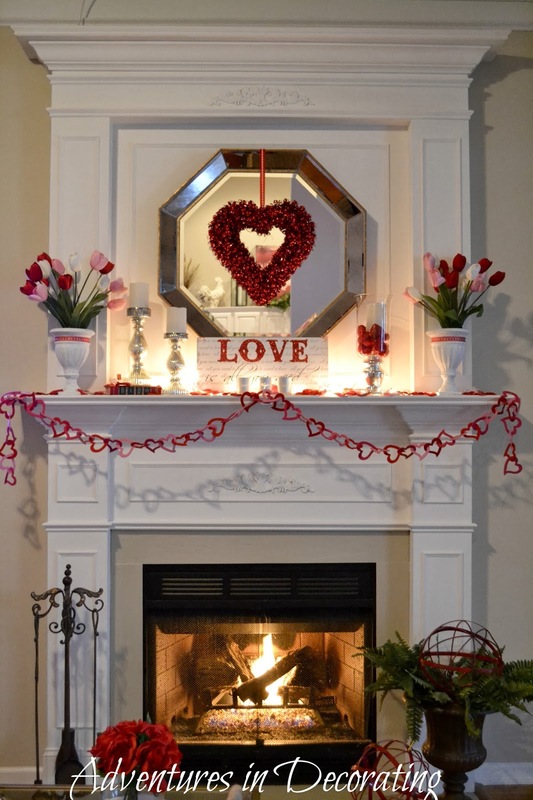 And, since I decided not to decorate a Valentine tree this year on our kitchen island, I used the heart garland (from Michael's) on the mantel, instead! 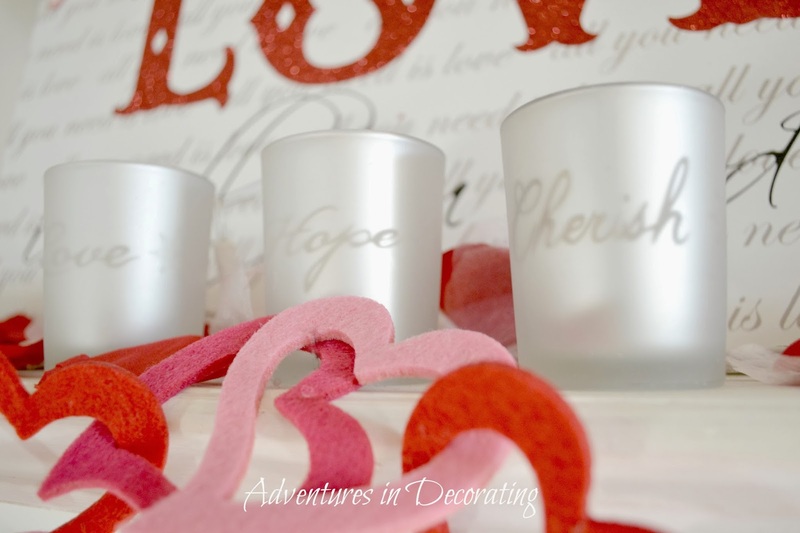 I was even able to use our silver, Christmas votives ... "love, hope and cherish" ... those words seem fitting for Valentine's Day, too, don't they? These matching red, "chippy" orbs simply *had* to jump in my cart when I was at HomeGoods this past Fall! I see these two traveling all over our home (both inside and out)! I love it Becca!! So, so beautiful! I love it!! I don't do much decorating for Valentines Day. I normally try to do a little bit but with moving it hasn't seemed to happen haha, so I have a wreath on my front door does that count? I love this! Your mantel is so pretty and festive! I love the pops of red! I have been waiting to see this since your sneak peek!Thanks for sharing your great ideas! I was wondering when you'd show us how you "prettied up" for Valentine's Day and as usual, you didn't disappoint! Guess I need to get our a few things for Valentine's Day soon if I want to enjoy them for a couple of weeks. I love your mantle all lit up at night....so pretty! 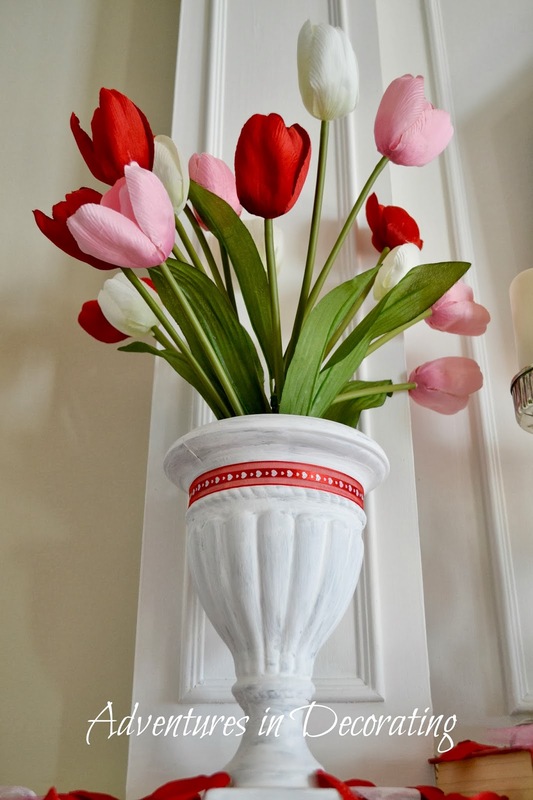 What a beautiful mantel - it looks so pretty … thanks for sharing your lovely inspiration …. I swear, you are like the Disney Land of mantel decorating. Looks wonderfully romantic and fun at the same time! 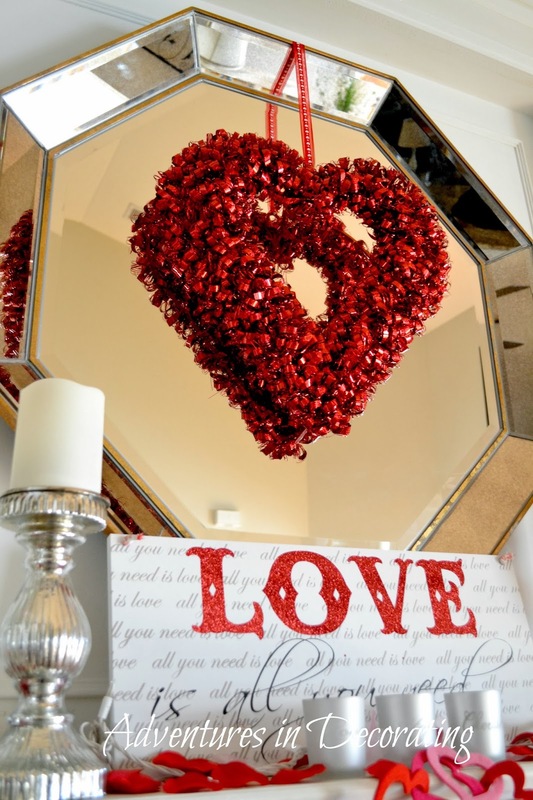 Terrific heart shaped wreath and those red orbs are fantastic! Just gorgeous Becca…you create the best mantels!..Can always rely on you for such great inspiration!! Very pretty Becca! Love the silver mixed in with the red and whites. I always love your mantel decor. So gorgeous. It looks so pretty, Becca! 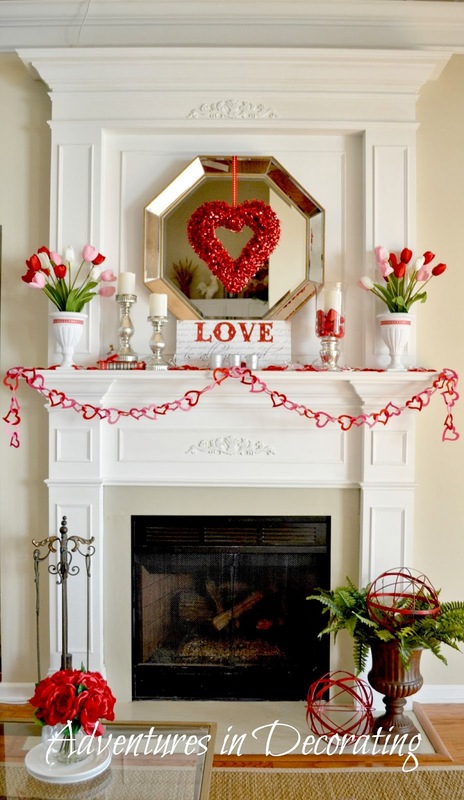 Love the heart wreath and heart garland! Very cute and colourful! I love the balance! Becca everything looks lovely as always. I really love the garland and that wreath. Your fireplace is so beautiful. It's beautiful my friend. I sure wish that I had the time to pull out my valentines goodies. Another great mantel Becca! So pretty! So Pretty Becca!! I love the heart garland and the red metal orbs. That last shot with the lights is beautiful!! What a beautiful mantel, Becca! Your wreath is gorgeous. 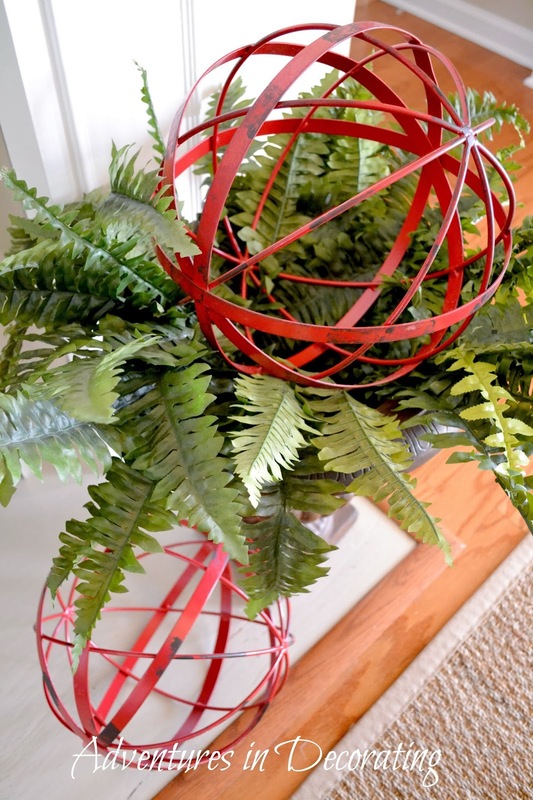 Your seasonal decor is always fabulous! Becca, your mantel is beautiful! Very sophisticated and really lovely! Those orbs are fabulous! Can you come decorate my mantel just like yours? Love it! I really like the lights...I think they're always so pretty and cozy at night.